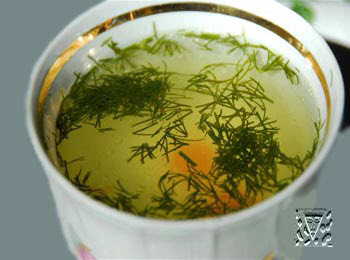 A considerable place in the Tatar kitchen occupies shulpa (broth). Shulpa season with onions, carrot, parsley, pepper, laurel sheet, and she is meat, fish, vegetable and mushroom. To wash meat, not pressing out juices, to cut to pieces weighing 300-350. After to put in a pan, add cold water, to cover a lid and to put on a fire. Warming to regulate so that there was not the stormy boiling, otherwise shulpa will become turbid. Scum, appearing at boiling, it is needed from time to time remove, otherwise she will settle on a bottom and her it will be difficult to separate from shulpa. If scum already had time to settle, it is needed to add cold water to broth, and she will emerge. After the removal of scum, shulpa is necessary to give again to begin to boil. If meat for preparation of shulpa was fat, part of fat, floating in on a surface, is needed to take off and use for toasting of onion. Salt in broth is added for 20-30 minutes to the end of cooking. Meat usually is boiling 1,5-2 hours. To lay out the prepared meat in separate tableware, and filter shulpa through a colander or clean gauze. Meat can be used for the second dishes. Meat shulpa is possible to cook with a carrot, parsley (by a root), turnip and onions. Greenery and vegetables (whole or bisected) are laid only after the removal of scum. When they will weld, them is necessary to take out from shulpa. Meat shulpa is used for preparation of different soups - with groats, noodle, vegetables, and also for meat dumplings. On 1 kg of meat : a 1,5-2,0 litre of water ( depending on the capacity of tableware). 15 g of onions, 15 g of carrot and 12 g of root of parsley. For preparation of bone shulpa is possible to take tubular and flat bones: humerus, shins, thigh-bone and other. To dissociate meat from bones (to use flesh for preparation of other dishes). To cut the washed bones, put in a pan, inundate cold water and to put on a strong fire. When water will begin to boil, to reduce a fire. Bone shulpa is boiling 2,5-3 hours. 20-30 minutes prior to a complete to put salt, carrot, parsley, onions, laurel sheet. Prepared shulpa to filter. On 1 kg of bones : a 1,5-2,0 litre of water, 15 g of onions, 15 g of carrot and 12 g of root of parsley. To put a geared-up hen in a pan and inundate cold water. On a strong fire to take to boiling, to take off scum, and to reduce a fire and cook about 1 hour. Then to put a carrot and onions in broth, add salt. To take out the boiled hen from broth. To delete a carrot and onions. Prepared shulpa to filter. on 1 kg of hen : 1,5 л of water, 1 carrot, 1 head of onions, salt to liking.